You might find websites rating Lamai as the 2nd best beach in Koh Samui after Chaweng, but that creates a distorted reality, because there is in fact no difference in its quality. 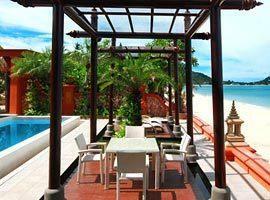 It is just as flat and great for swimming as Chaweng, it features exiting water sports and divine accommodation. 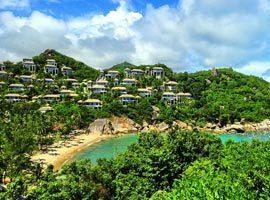 Below we feature only a few of the best hotels in Lamai Beach ranging from bespoke 5 star resorts, great 4 star venues, romantic places to stay and family friendly resorts. The fact that the area is less crowded than Chaweng, its streets not clogged with traffic while it still features a joyous nightlife and more restaurants than you will ever need might make it a better option if you find its northern neighbor as just too busy. Besides these motivations it is also central, only 10 minutes from Chaweng for when you feel like throwing yourself into the human current while moments to its south secluded bays like Bang Kao and Tong Krut reveal them selves. As mentioned Lamai hotels include some of the best names in Koh Samui featuring places like the luxury Banyan Tree Resort and Spa and Silavadee offering exquisite pool villa accommodation which is utterly romantic, Rocky's Boutique Resort with its intimate coves, The Beach Republic has ideal family accommodation in 2 bedroom villas and not to mention the ever popular Le Meridien. 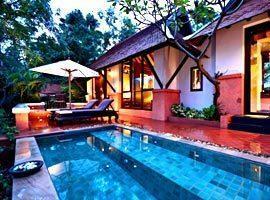 Ammatara Pura takes you back centuries in time emulating a lifestyle in an ancient Thai palace from the Raja era. 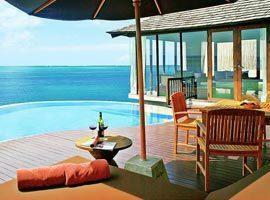 Historical charms together with exquisite pool villa accommodation is utterly romantic. This luxurious and romantic resort is located in a private cove where beachfront villas offers intimate accommodation, your own pool, ocean views from your sundeck and in-room body treatments. This trendy and modern hideaway flaunts creative design statements. It offers a snazzy beach club with 2 beachfront pools, intimate accommodation for couples and 2 bedroom suites for families. 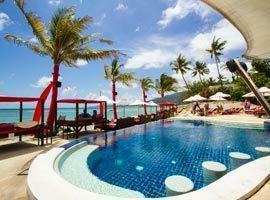 With a seaside pool, restaurant and bar with adjoining massage Sala Fenix Resort is all about beachfront relaxation. 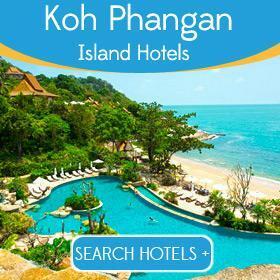 It offers modern and stylish superior sea view rooms and one bedroom suites near the pool. 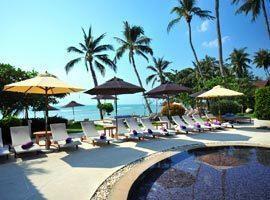 For a romantic honeymoon Le Meridien is hard to beat. 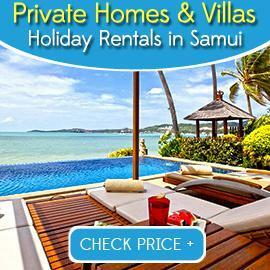 It offers private pool villas with a tropical outdoor lifestyle approach on a quiet part of Lamai. Romantic dinners are served on a floating pier. Pavilion is a boutique hotel for couples right on the water's edge. While the location may feel secluded it is near entertainment, shopping and restaurants. 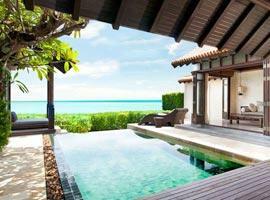 Offers villas with hydro pools. Cascading down a sloping hill it meets up with a flawless strip of sand below. 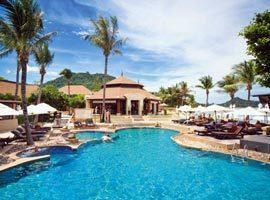 The views, including from its infinity pool are beguiling and its villas featuring whirlpools a honeymoon couple's dream. The charming setting of Rocky's with its 3 intimate coves is utterly idyllic. It offers rooms with pool or garden views as well as spacious beachfront bungalows with ocean views featuring Thai style decor. Want to really spoil your other half? Silavadee will give you the tools. Accommodation is luxurious and private, views from your personal infinity edge pool are interrupted plus it has a private beach.